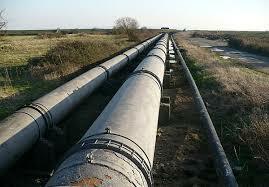 Sanding of Slurry Pipelines: The obstruction of flow within a slurry pipeline is sometimes referred to as sanding. Sanding can occur when particles or solids accumulate in a pipeline which in turn reduces the pipe cross section area or flow path. This is associated with an increase in friction loss. An accumulation of sanding can result in lower flow rates, lower delivered solids content and higher discharge pressures. This can negatively affect output and if overlooked or ignored, can have significant safety implications. Continuous accumulation of solids the pipeline can eventually lead to a blocked pipe. The reduction in pipe cross section area from sanding results in a lot of energy being transferred to a small volume in the system pump. Over time, the carrier fluid or liquid will boil and the resultant steam can become pressurized. Blockages can then result in catastrophic failure where the pump may even explode. In some cases, a bed of particles or sediment may form on the bottom of a pipeline without completely blocking the flow path. Under this operation, the pipe continues to deliver solids however, it is often recommended to avoid operating under these type of sanding conditions. Left unresolved, this can lead to eventual pipe blockage which will require a complete shut-down of the slurry system. Continuously operating under these conditions results in higher pressure losses and higher energy requirements and associated costs. If you have identified sanding in your slurry lines, what options are available to you? Firstly, you can consider increasing throughout to clear the lines by increasing the pump speed. Secondly, you can consider introducing fine particles as these fine particles help to increase the fluid density and viscosity and may clear the solids build-up/bed on the base of the pipe. Another option to consider is flushing out the pipelines with water however, caution must be exercised with this option as, the pressure the pump develops when pumping water is generally lower than that it develops when pumping slurry for the same given pump speed. This therefore may or may not be a viable solution depending on the characteristics of the system. Of course, you can also shut down the pipeline and manually remove the blockage. This however may not be the most economical solution as it can delay site productivity and effect potential revenue. Selecting an appropriate software tool is a logical step to take when designing your slurry pipelines. This will help you identify operating conditions and the risk of sanding. FluidFlow helps you characterise your slurry as well as model the slurry pipeline. The software allows you to determine the deposition velocity of the slurry and you can now choose from four correlations for this function. System pressure losses are calculated using any of five methods and solids derating of end suction centrifugal pumps can also be considered. Warning messages are enunciated to help you identify any trouble-spots or risk of sanding/pipe blockage. FluidFlow software has been used successfully to model slurry flow systems by Worley Parsons, JACOBS, HATCH, Emirates Global Auminium, Rusal Aughinish, BHP Billiton, Ambatovy to name a few.